Barely made it as I was late in registering due to overseas commitment. But am very glad that Ria managed to “squeeze” in a place for me! I have been to Sekudu twice and this will the first time after the great deluge that wipe out a lot of the organism. (Refer to previous blogs regarding the mass death in Chek Jawa). 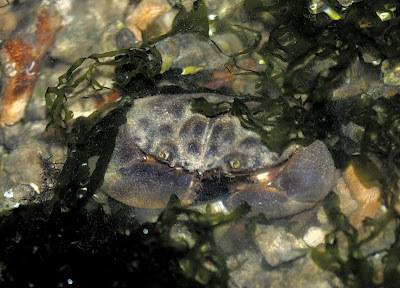 We landed on the sand bank closed to 8 pm with the tide still a bit high, not withstanding – most of us hit the intertidal areas wanting very much to be surprised by the finds. Plodding through the mud, sand – somehow I have this eerie feeling that Sekudu is still slow in recovering. For the last 2 trips we have seen so much but it was pretty “quiet” for this trip. With the people fanning out, it was matter of time that discovery was made. 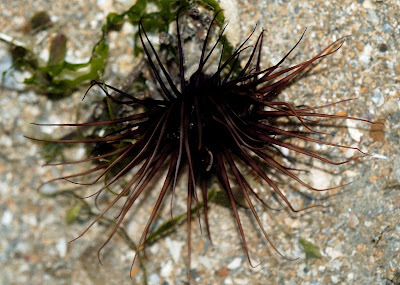 Soon we managed to locate sea anemone, sea cucumber, sleeping damsel, climbing crab, minuscule nudibranch, 8 legged sea star and many more. Still compare to previous trip it was pretty “quiet”. Wish that the recent downpour that we are experiencing, it will not delay the recovery of Sekudu. And I am really glad that the authority has made the landing on Sekudu a “permit required” zone, hopefully this will aid in the reocvery. I was armed with my favourite Tamron 180mm F3.5 Macro lens, why favourite because I do not have to bend down so much as compared to the shorter lens! Taking macro picture is already tough, but couple with night shot, and flash photography on water surface or wet body, that become worse. Thus to take proper macro shot, one has to be like the octopus. You need more than 2 hands to hold the flash light, lens, camera body, specimen etc. Some of us resort to using the mouth to hold the light, but the best “octopus” method is to be with buddy. Taking turn to provide illumination to the specimen so that the other party can focus and steadily take the shots. 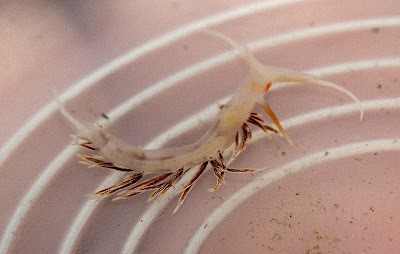 On this trip, my desire was to take real close-up of the specimen, I focused for the eyes, the skin, the tiny feet, the rhinophore, leaf blade etc. Well hope you enjoy this series. 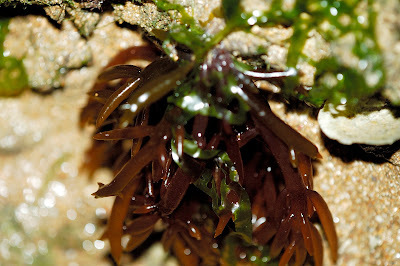 This succulent brown sea weed seems to be proliferating here. 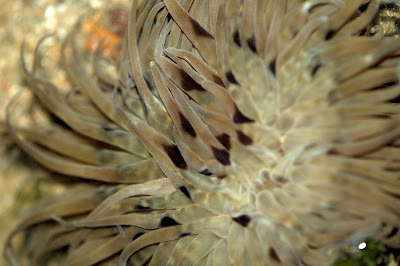 Found these anemones, the “flowers” of the sea. 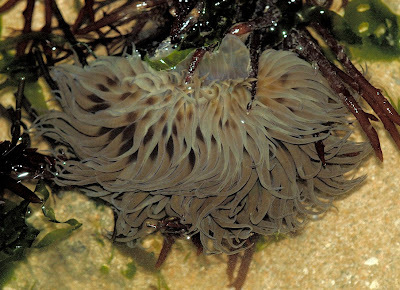 Below is the Peacock anemone, which in reality is not a true anemone (Order Ceriantharia) whereas the order for anemone is Actiniaria. 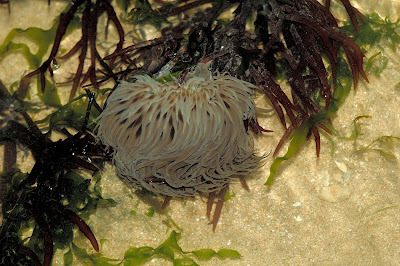 This Swimming Sea Anemone (Boloceroides mcmurrichi) was attached to the sea weed. Most unusual relationship, or probably it was just “relocating” and has just landed! Moving along, I sense movement in the water and there was this Thunder Crab (Myomemnippe hardwicki) feeding merrily in the sea grass. Stole this shot while it fed in the rippling water. 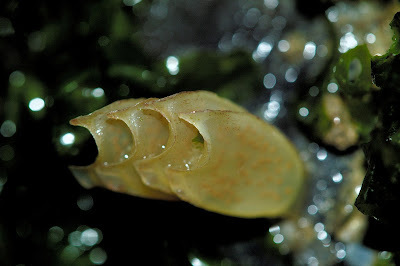 Subsequently, I came across this egg capsule of the Spiral melongena (Pugilina cochlidum). Have seen them many times, and decided to do a real close up. A very interesting shape forming to a pair of “horn” at the end of the capsule. What we must be amazed is the pitch that is so orderly and precise between two egg capsules! Such precision, is it for water to flow through between them more efficiently so that they can be aerated, such is the mystery of the sea! 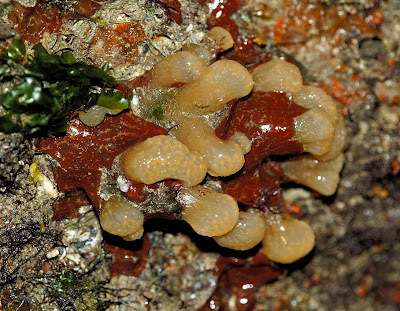 On some of the rock face, and there are many rocks and bouders in Sekudu, there were a lot of colonial ascidian (Family Polyclinidae ) clinging and thriving. 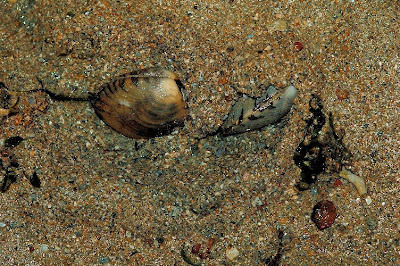 What is the locomotion of the clam? 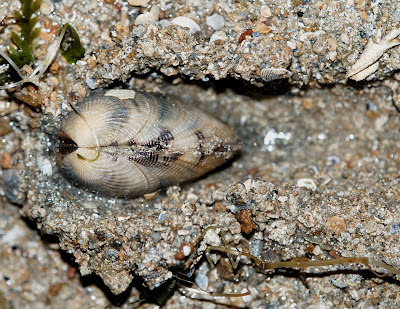 The venus clams (Family Veneridae) usually burrows downward, it will extend its foot and dig downwards. But in this instance, they seemed to be making horizontal movement. In these pictures, it looked like it is moving with its hinge portion forward . As you can see they left behind the “excavation” mark. Perhaps, these individuals were being pushed by the wave or tides! This again will chalk another mystery of the sea. 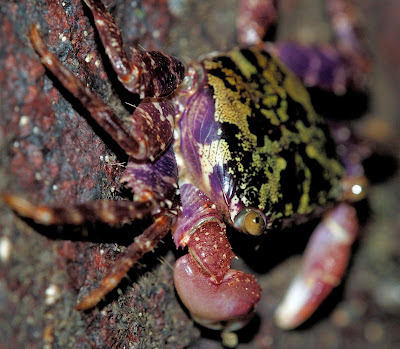 On one of the rock, we saw two Purple Climbing Crabs (Metopograpsus spp), happily feeding on the rock. 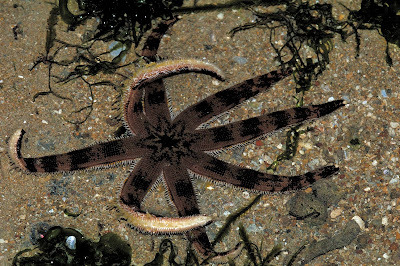 Nowaday, the eight legged Sea Star wonder Luidia Maculata is a rare visitor to our shore. The last time I saw a Luidia Maculata was my very first trip to Sekudu, and now will be my second time to have this privilege again. 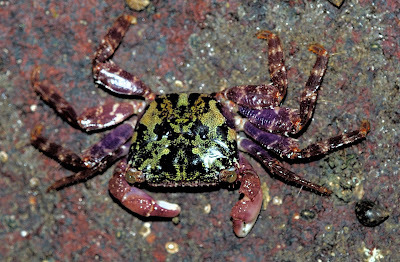 Compare with the previous specimen, this was like a juvenile with a span of about 20 to 25 cm. 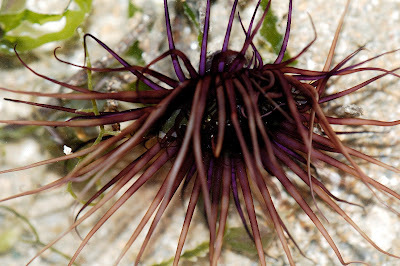 In the water, this specimen somehow has a build in “compass” with all its 8 legs pointing towards the sea! Somehow, it just wanted to get back to the deep end. 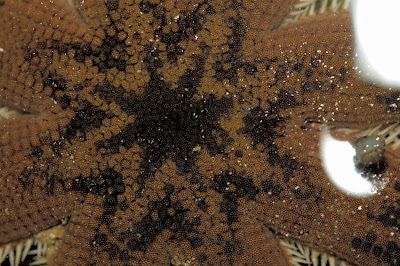 This Sea Star is a carnivore, which likes to eat other sea star. Observe the masses of “legs” and the pattern on its skin. 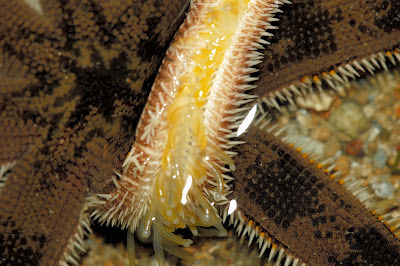 The pigmentation is unique and beautiful for such a rough skin (echinoderm). 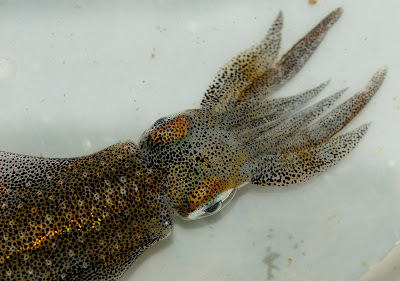 Chay Hoon, our “nano” specialist caught this common squid (Sepioteuthis sp). Observe the skin colouration also called Chromaphores. 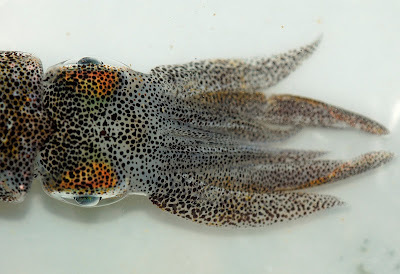 Extremely effective in the changing of colour, for camouflage prupose, and some scientists believe also as a type of signal to the other squid, for mating as well as to ward off competitors. First time I am noticing that there are lens covering for the eyes, with the black eyeball seemingly in the centre. 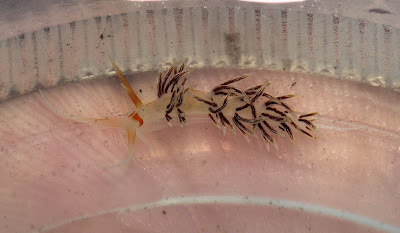 Our Chay Hoon lived up to her name sake (nano hunter) with this nudibranch. She found 3 of them, the largest being 1 cm in length, and the other twos at about 5 mm and 8 mm. 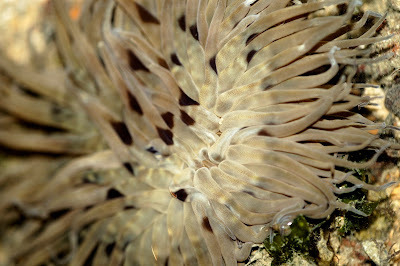 It was really tough taking pictures of these minute creatures. For another close up, please refer to the tidechaser blog. Ria, our mentor naturalist always tell us – make sure you take the underside of slugs. 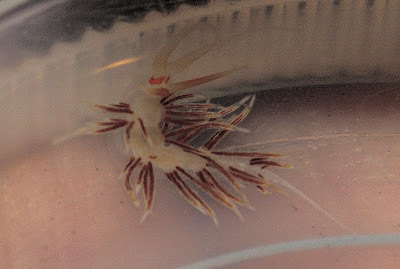 So this is the underside of this nudibranch. Ria was right, you can break your back trying to take pictures of these marine creatures, but frankly it was worth it, of course the long lens did help.